Just as easy-to-use desktop publishing software that ran on affordable hardware made everyone a publisher nearly three decades ago, today’s powerful combination of the Internet, social media and omni-channel marketing has allowed virtually all organizations to become media companies. Stakeholders from sales, marketing, finance, operations and other business functions are creating, managing and distributing content in a wide array of formats, from text and still images to interactive assets and video. 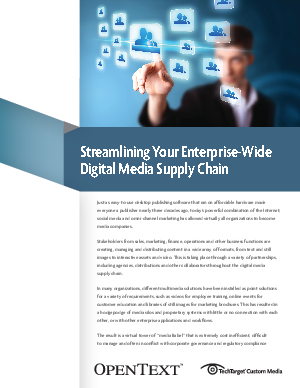 This has resulted in a hodgepodge of media silos and proprietary systems with little or no connection with each other, or with other enterprise applications and workflows.